Given current prices of a decent verte or blanche here in the 21st century, it’s easy to develop a notion that absinthe was consumed exclusively by wealthy citizens who could afford high-end luxuries, stirring their costly green elixir in an expensive crystal glass with a silver spoon. While it’s true that there was a period in France (primarily during the mid-1800s) during which absinthe was the almost-exclusive purvey of ex-soldiers with healthy pensions, and wealthy bourgeoisie folks with a lot of francs to burn, the drink was within reach for all but the poorest members of society by the 1880s. For the average working man, enjoying an absinthe didn’t necessitate clopping down to the finest cafe on the boulevard in a horse-drawn carriage and stepping out with a fancy walking-stick and wearing a cape (although, admittedly, that would have been my preferred entrance way back when); our local working-class hero could simply walk down to one of thousands of local cafes, fire up a pipe or a cigarette, and whet his appetite with a glass of the house brand absinthe while chatting with friends and locals the way he always did. To amuse themselves and to gamble away a few louis, there was an ever-growing assortment of bistro games becoming available all the time, but nothing could top the popularity of a good old-fashioned card game. And to talk about ideal product placement: imagine having a captive audience of four or five people seated at a table for an hour or two, and having them continually staring down at your brand name while they entertained themselves, considering whether to raise the bet, draw another card, or punch Pierre in the face for winning the past three hands in a row. Tapis de cartes, or “card carpets” such as the one pictured below, were an effective means of advertising, and were likely to have a longer lifespan than posters and flyers, although serving as a placemat in a bar does take its toll. 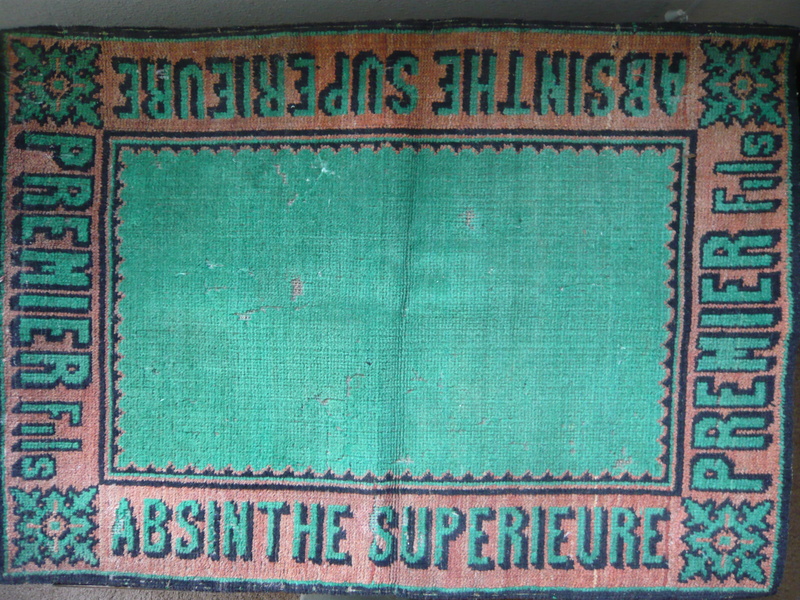 Even the post-absinthe card carpets from the 1920s and 1930s advertising pastis and the like are fairly rare; finding a genuine absinthe-branded card mat from the pre-ban period is even more difficult to do. It’s nice to see that they still work their magic, though, as I can’t help but feel myself getting a little thirsty for a tasty verte just by looking at it.